I'm new to site and glad I have found it! 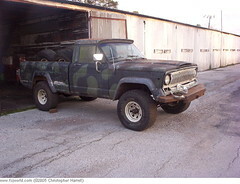 I own a 72' J-2000 and am in the process of acquiring the necessary parts for the conversion. I have a Cummins 4BT/TH400 to swap in and need to swap out tailshafts to keep the Dana 20 t/c. I also picked up a Dana 70u, open carrier, 4.10 gears, complete with springs and wheels. I plan to get a DRW D60 passenger drop axle (hopefully this weekend if the price is right). Has anyone done this conversion on this site? Any and all suggestions are welcome! I've done something similiar and you can read about here: http://www.ifsja.org/forums/vb/showthread.php?t=83955 I'll subscribe to this thread so I get notices of questions you have. The Dana 70 U will likely be 2" narrower on the WMS than your front axle IIRC, that may be fine or you may want to use wheel spacers to even it up. I used a '73 frame, swapped later model front spring hangers to locate the D60 DRW front axle with J20 springs and then cut 4" sq tube for under the frame hangers for the rear to fit the 3" wide springs I took from a Ford box van with the D70 U, only I used a D70 HD instead. Hey great thread link. Loads of info. Im just shy of finishing my trail rig so the J-truck is scheduled to occupy the shop space soon. Thanks for the welcome. Bear in mind that when you install the D60 up front that it raises the truck ~6". When I used the 3" Ford springs under the frame in the rear it raised it about 6" there also. You may not want that height. It's possible to put the springs under the axle in the front and you could certainly do that in the rear also. If you try to retain your current spring position in the rear I think you will find that U-bolt plate will interefere with the drum backing plate... that was a problem with both a 14bolt I've used and this D70HD. If you are able to use a disc brake conversion in the rear it might be possible to retain the stock Jeep rear spring configuration but you may have issues with how the caliper locates in relation to the spring. Also, I don't know how familiar you are with full size Jeep rigs but when you go from spring under axle to spring over axle up front and pick up 6" of lift on stock springs it requires at least the installation of a high steer arm and new drag link, then... longer or relocated shocks, etc. 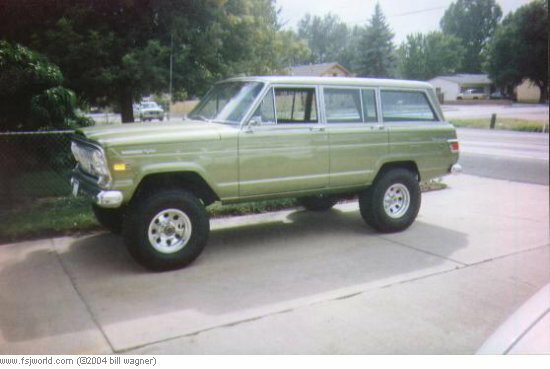 Elliott wrote: Also, I don't know how familiar you are with full size Jeep rigs but when you go from spring under axle to spring over axle up front and pick up 6" of lift on stock springs it requires at least the installation of a high steer arm and new drag link, then... longer or relocated shocks, etc. Yes, I already have the set up for Hi steer and leftover DOM for the drag link. On my trail rig I used heims but for this I definately am sticking to TRE's. Any suggestions as to necessary goods required to convert to discs on the D70u? Where can I get caliper brackets or do I have to fab them myself? What are the best or easiest calipers to use? If you use '76-'78 Caddy ElDorado calipers they are both large calipers and have parking brake linkage on them. D70hd dually axle with dually wheels. 16" steel wheels, the caliper may need just a touch up with a flapper wheel on the outside edge. Here is my platform I will be working with. I also have the rhino grill to put on later, some Grand waggy seats and console to reupholster and will repaint (and remove typical rust for J-trucks). I'm still trying to decide on making a flatbed or stretch it and using j20Brett's old LWB bed. I also got his old flares and was thinkig I could add some metal and make dually flares. I don't know, I'm making this crap up as I go! You can use any of the '74+ front springs you want depending on what GVWR you are looing for. On the dually I'm building I have the front springs from a '79 J20 that was rated at 8,400 Lbs. all the leaves extend fully to support the main eye, unlike any of the other FSJ springs. Found a late 70's Dodge DRW D60. Would this be a suitable candidate for the front? Is there a difference between Dodge and GM WMS? The price is right and it is supposed to be the same gear ratio. I just don't know if there are more desirable 60's I should wait for OR if it really makes a flippin' difference for a tow vehicle. You can use the Dodge DRW front 60. If you are going to run dually rims or H1's without recentering them it's about perfect. The spring pad width is ~1/2 wider than the FSJ or GM front axle but guys just hog the hole for the center pin out a lil.